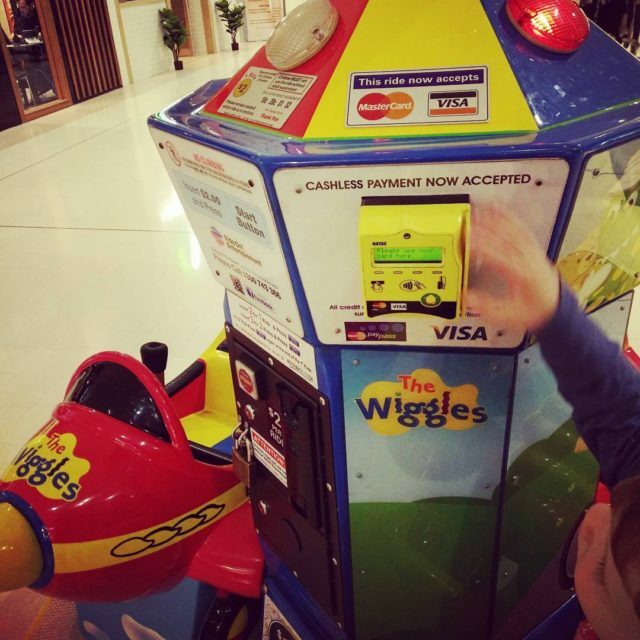 Kid rides accept card now. It’s a ritual of ours that almost every time we go passed one of these rides in the local shopping centre, he has to climb on it. He hardly ever gets a paid ride; he just likes to sit on each seat and play. Since his first actual paid ride he’s aware of what the machines do and asks for a coin to be put in, however we normally distract him or just say “no” or most often protest we have no coins (which is often true). This is the first one of these rides I’ve ever seen that has a card reader on it. I do have to wonder how much they can actually make from each swipe given fees, though I’m sure someone has done the bean counting otherwise they wouldn’t have put it there. When he found this new item on the ride he didn’t give it much attention – it didn’t do anything for him – and needless to say we did not explain how it works.